Planetarium and Institute of Popular Science (Image Source: Friends of the Zeiss). Public access to Pittsburgh's Allegheny Observatory has become a little more difficult since the closest and most logical bus stop, which serves both the Allegheny Observatory and Riverview Park, has been eliminated by the Port Authority of Allegheny County (PAT) public transit system. In their attempt to streamline the public transit system, PAT has been eliminating transit stops, for both the bus system and the Light Rail rapid transit system (only street level stops). This includes the elimination of a bus stop at Riverview Avenue, on the Route 8 Perrysville bus line. This bus stop was located one block from the entrance to Riverview Park, and the Allegheny Observatory which is located atop a hill just above this entrance. Now, the closest bus stop to Riverview Park and the Allegheny Observatory is another block away at Venture Street [the inbound bus stop is located at a historic, stone bus shelter, built by the Works Progress Administration (WPA) during the Great Depression]. The Venture Street bus stop is also located around a bend on Perrysville Avenue, where Riverview Avenue is not even visible. For out-of-town tourists, or even other city and county residents not from the North Side's Observatory Hill neighborhood, attending tours or lectures at Allegheny Observatory, the Observatory is now more difficult to find and reach by public transit. When the new Allegheny Observatory opened in 1912, famous astronomer and telescope-maker John Brashear had specifically constructed the Observatory not just for astronomical research, but also for public education. In this era, scientists had started to locate astronomical observatories on mountaintops, far away from city lights and pollution. However, John Brashear sited the new Allegheny Observatory away from the center of Pittsburgh on a high hill in a new city park, just one block from a major streetcar line, for easy public access. 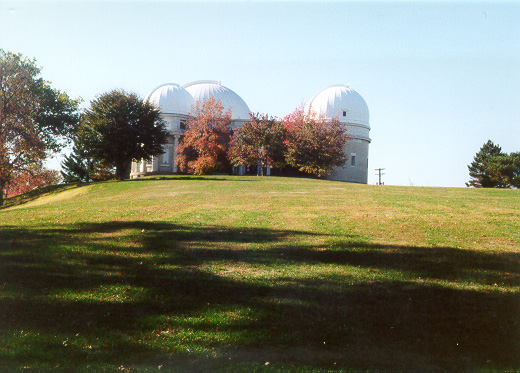 Today, the Allegheny Observatory is the largest astronomical observatory within the city limits of a major American city. He also arranged for the Observatory's original 13-inch Fitz-Clark refractor telescope to be in one of the Observatory's three astronomical domes and to be used primarily as an educational telescope for the general public. And, he insisted on construction of a lecture hall for educating the public in Astronomy. The Allegheny Observatory also includes an Astronomy library (including two balcony levels), which is a branch of the University of Pittsburgh Library System. Good morning. I am Glenn A. Walsh, 633 Royce Avenue, Mt. Lebanon, a regular Light Rail and bus rider who has chosen not to drive a motor vehicle since 1985, to help save energy, protect the environment, and reduce city traffic congestion. I have been an active transit advocate for more than 37 years, including 3 terms (1984 to 1989) on the Allegheny County Transit Council as a Charter Member. My comments today are my own and do not reflect those of any organization. After an Allegheny Observatory lecture on July 17, an inbound Perrysville bus passed me at the Riverview Avenue stop. Only then did I realize that there was no bus stop sign. I was stunned, because there had been a bus stop there for decades. And, for good reason: it is the closest and most logical bus stop serving the Allegheny Observatory and Riverview Park! In 1912, famous astronomer and telescope-maker John Brashear, specifically, located the new Allegheny Observatory close to a major streetcar line, for easy public access. Eliminating the closest and most logical bus stop to the Observatory makes public access more difficult. Perhaps people in the neighborhood know about this bus stop elimination. What about people from other parts of the city and county, and out-of-town tourists, attending tours or lectures at the Allegheny Observatory? And, what about people attending films and other events and activities in Riverview Park? No bus stops near any cultural institution, tourist attraction, or park should ever be eliminated! And, these Riverview Avenue bus stops should be restored! Barnes, Jonathan. "PAT and Public: An Easy Trip to See the Stars Must Be Restored." Blog Post. "Brashear: Time Capsule Unveiled; Telescope Retired." 2015 July 9. "Update: Historic Brashear Time Capsule." 2015 April 9. "Dispute: Ownership of Brashear Time Capsule." 2015 March 26. "Historic Brashear Telescope Factory Time Capsule Found & Opened." 2015 March 25. "Historic Brashear Telescope Factory Wall Collapses." 2015 March 18. "Brashear House & Factory: Nomination to National Register of Historic Places." 2012 Oct. 11. Historic Nomination: John Brashear House & Factory, Pittsburgh." 2012 Sept. 13. "Mystery: Brashear Telescope Donated by Frick to Pittsburgh Suburb Missing for Decades." 2012 May 7. "Pittsburgh's Allegheny Observatory: New History Film." 2012 April 19.